Close up of left side of necklace. Yesterday I had one of those moments of inspiration! I went to Beverly's to show another crocheted teacup that I made in ecru and pink. The pattern is easy enough but I don't like how small the cup is compared to the saucer. So I keep trying to adapt the pattern. In any case I was told to move onto other projects for the tree, we still need poinsettias for the tree. The problem is that I'm not sure how big to make them. The tree is due in 13 days so I need to concentrate on the embroidered mirror as well as the flowers. Beverly's was really busy because they had a 65% off fall stuff. Sadly I didn't have the money to buy the glass pumpkins. But I did get a spool of pink thread, pink felt and they had the large size of the clover flower tool. 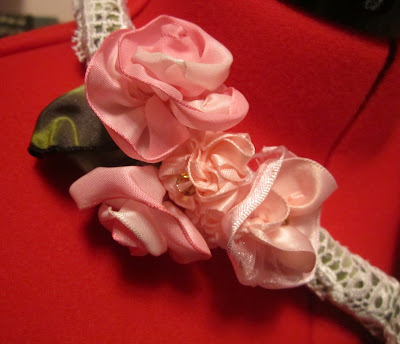 The large size Kanzashi Flower tool seems to be different from the small. So I will have to play with it a bit more before I decide if I like it. So instead of standing around at Beverly's I went to Cafe Noir and had ice tea and Russian tea cakes. There was supposed to be a write-in for Nanowrimo at Cafe Noir from 12:00 to 3:00. Only Lee and I were there. So Lee was writing and I was working on poinsettias when I felt inspiration hit me like a 2 ton weight! The night before I had tried to cut straight strips of pink satin fabric with the idea of some how making them into flowers. The price of ribbon is so high right now that I really can't afford the ones I want. In fact Betty's Fabrics have some very old silk ribbon that is half the price of the new poly ribbons! So if I want to continue making flowers I needed to adapt! I was looking at the Kanzashi Flower tool when inspiration hit! I took out the pink fabric strip and started folding a rose. I started by rolling a center and then folded the ribbon back and sewed the rolled center to the ribbon making a petal curve. Here it got tricky because the unfinished edges were showing. So I gently folded the raw edge under the ribbon and carefully tacked it down. Not the easiest thing to do because of how much the fabric frayed. I made two more folds and then started gathering the rest of the fabric. First stitching close using small stitches and then spacing them out gradually and making longer stitches. Once the fabric was gathered I pulled it tightly. Then with another thread I started to sew the gathered fabric to the rolled center. I found that the tighter the fabric was gathered the better the flowers came out. The fabric flowers turned out to be really lovely. So I decided to make a fabric necklace with the flowers. I took some of the cotton cord that I made the fabric basket out of and wound green ribbon around it. Then I sewed some white lace over the green. I decided to curl the ends for interest. Unfortunately the flowers were to big for the necklace. 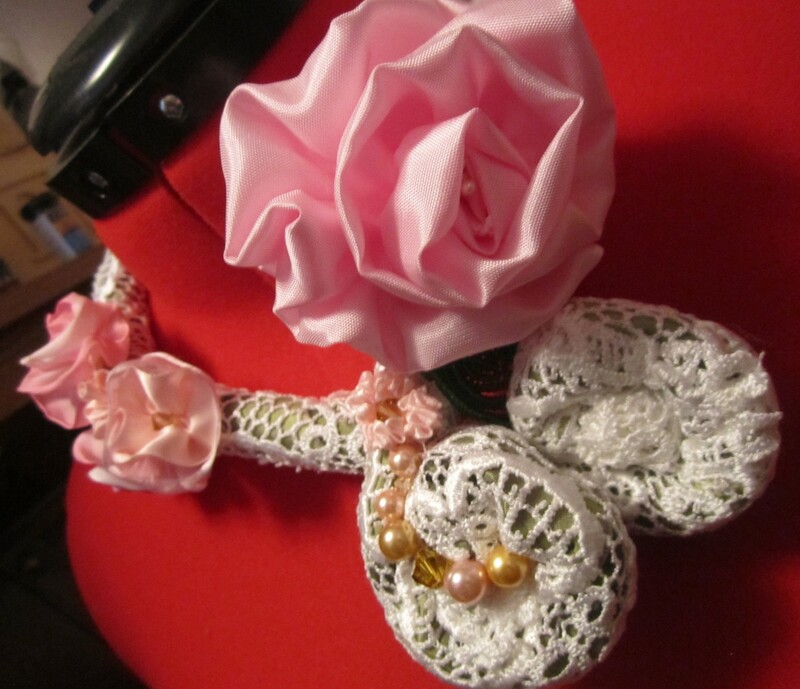 So I made some runched flowers and rolled roses out of 1 inch pink ribbon. One of the large roses I put on the necklace over the close. I added gold and pink pearls and gold crystals. It was hard to decide where to place everything. Then I remembered that I have a dressmaker's dummy. 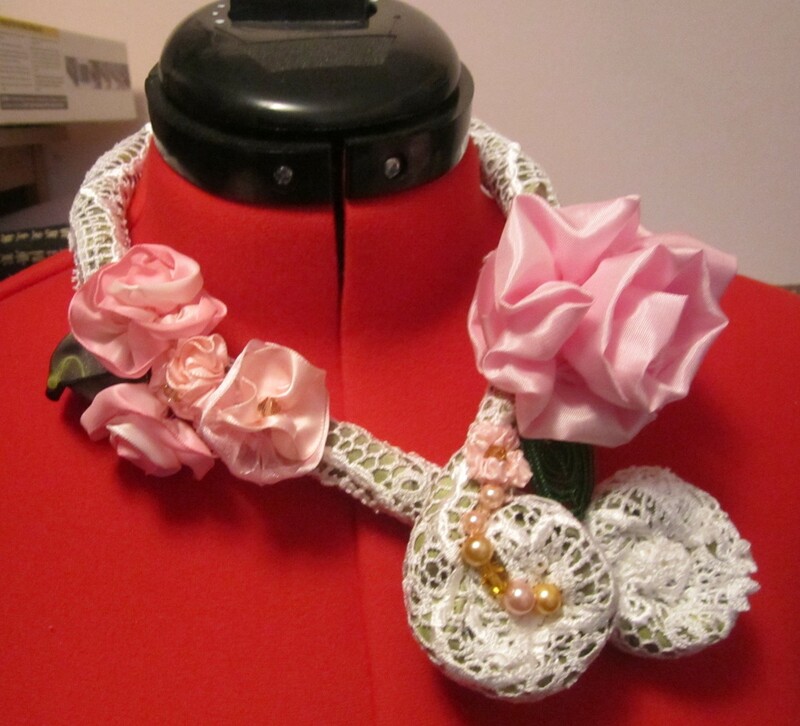 So the dummy was helpful in arranging the flowers, I really love the necklace but some more leaves and pearls will be needed to finish it. I worked all day on it because I was afraid of loosing the momentum but now it has been a two day effort and I need a break.